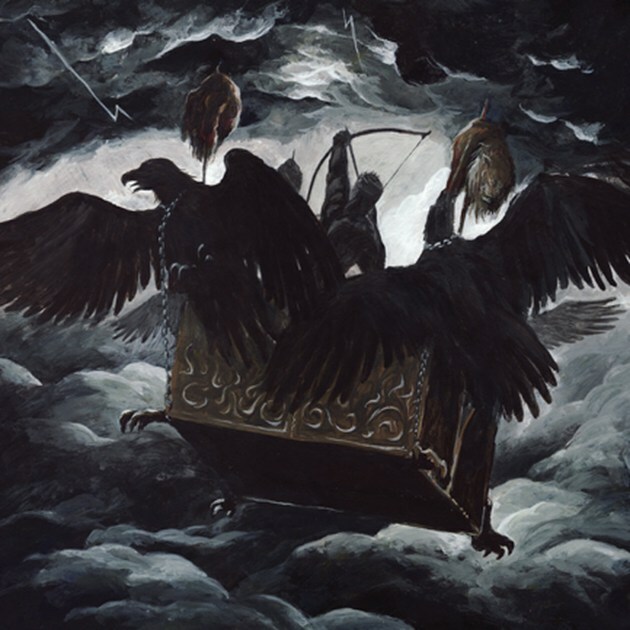 Deathspell Omega’s 2010 record “Paracletus” is the greatest black metal record ever recorded, so the expectations for a sequel record were kind of high. Yeah, yeah, that’s a haughty statement that just begs for disagreement. Fine. Best in the genre or not, few seasoned black metal listeners would argue that “Paracletus” was anything short of really, really good. A brief, albeit enjoyable, follow-up EP aside, the French black metal outfit has been largely quiet for the better part of the decade. The band’s sixth record, “The Synarchy of Molten Bones,” breaks that silence. Well, some outlets are calling it an EP. But it’s about 30 minutes long. So what the Hell, let’s call it a full-length album. Branding aside, consistency and atmosphere are the keywords here. Although the four tracks do not flow as a continuous piece, the record undoubtedly works best when listened to in a single sitting. Instrumentation and vocals are predictably fantastic, but it’s the gripping atmosphere that really pulls the album together. A wonderfully unnerving intro aside, little time is wasted on meandering ambience, breaks or interludes. This is a eerie and remarkably fast-paced black metal record, full of malicious intensity, pristine dissonant riffs and ghastly, inhuman vocals. All of which are to be expected, of course, but few bands are capable of creating such a cohesive package. The opening title track and particularly frantic follow-up “Famished for Breath” more than fulfill the genre’s requirements for breakneck speed and heaviness. Though they run the typical black metal gamut from rapid black metal shredding to grisly howling — and do so better than most other bands in the genre — it rarely becomes route. Deathspell Omega are masters of unconventional song structures and each of the record’s tracks have just enough twists and turns to keep things interesting, despite their length. “Avant-garde” is an appropriate descriptor, but “The Synarchy of Molten Bones” is hardly a pretentious or inaccessible album. It’s well-produced and experimentation is abound, but it’s wrapped together in surprisingly straightforward fashion and just feels raw. That’s not to say the record lacks standout moments or impressive creativity. The massive ten-minute “Onward where Most with Ravin I may meet” is positively soaked with foreboding atmosphere and diverse riffs. It’s a towering, varied piece that feels far shorter than its run-time and is by far the album’s standout track. So is “The Synarchy of Molten Bones” a black metal classic or as good as “Paracletus?” No on both accounts. A very few brief moments aside — closer “”Internecine Iatrogenesis'” final riff is legitimately haunting — the record never reaches the vast creative depth of prior standout songs such as “Devouring Famine” or the startlingly vicious intensity of tracks like “Have You Beheld the Fevers?” and “Fiery Serpents.” “The Synarchy of Molten Bones” is astoundingly consistent, but doesn’t quite inspire jaw-dropping spectacle like the band’s finest works. Still, that’s hardly harsh criticism. At it’s worst, “The Synarchy of Molten Bones” is still one of the best metal records, black or otherwise, of the year and more than a worthy follow-up to “Paracletus.” It does get better than this, but just barely. Have even a passing interest in black metal? You should probably buy this.